There are often discussions (esp. amongst the Lindy Hopper crowd) about the "grinding" and "pelvic thrusting" nature of Blues Dancing. This is a bit surprising to me, in this day and age. Blues Dancing, done with proper athletic posture and connection is less intimate then, say, Tango dancing. The dance in itself is not some lewd excuse for bumping and grinding with potential mates, in fact, if you've ever taken a proper beginning Blues class, you'll discover that this is about as appropriate as it is in the Polka. I do recognize that there are people who take advantage of the closeness and often dim lighting to do what effectively amounts to sexual assault. This should not be somehow confused with Blues Dancing, if anything, this only makes the assault seem reasonable by calling it dancing instead of calling it what it is, assault. I would be quite happy if people treated it exactly as it is. But to say that this somehow reflects on Blues Dancing is odd to me. There are people in every large social group, dancing or not, who engage in undesirable behaviors. There are people who act inappropriately who dance Salsa, Tango, Polka and so forth. Should we sully the names of these dances as well? Following this reasoning is a logical fallacy of a number of forms, the Biased Sample, Misleading Vividness, Spotlight, and Questionable Cause, and in a sense is an indirect form of the Ad Hominem attack. What does it mean that it's a logical fallacy? It means that the argument does not make sense. As compelling as it may be emotionally, it does not make sense. This report is informing us about the dangers of Lindy Hop. Yes, Lindy Hop, the happy, bouncy dance of innocents, was once considered to be corrupting the moral position of the youth of our country. 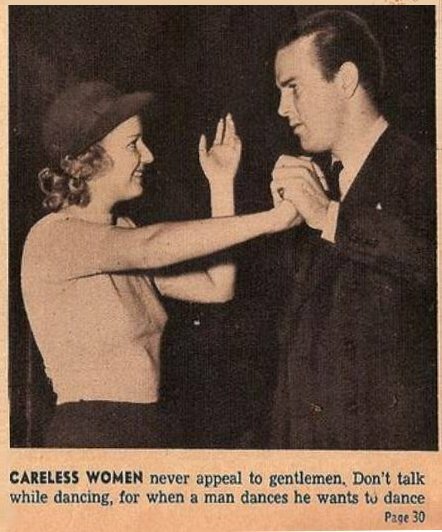 This was a common stance almost a hundred years ago, amongst people who didn't know what the Lindy Hop really was. It turns out the Lindy Hop is just a dance, not the sweet tool of Satan that many thought it to be. So consider, if you are making the argument that Blues is a dance of grinding and sexual promiscuity, then you are to today as those article writers were to the 1920s. Is that the company you want to keep?